WASHINGTON — It starts with just a few basic ingredients (onion, garlic, chickpeas, greens and coconut milk), but the end result has a powerful effect — one that’s taking over the internet. 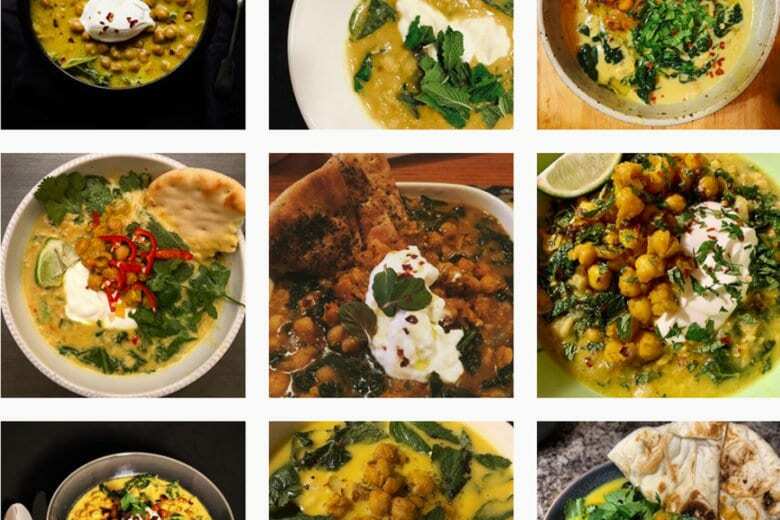 Spiced Chickpea Stew with Coconut and Turmeric, a recipe developed by New York Times food columnist and cookbook author Alison Roman, is currently the darling child of social media, where it is more commonly referred to as #thestew. On Instagram, the hashtag has more than 3,500 posts. The recipe on The New York Times website has more than 3,200 ratings — and it was published only two months ago. “I still am struggling to figure out how that happened,” Roman said about the immediate love for her creamy, spicy and golden-hued stew. That last reference hits on Roman’s Salted Chocolate Chunk Shortbread Cookies, which experienced similar social media fame last year. To date, the recipe, which can be found in her “Dining In” cookbook, has garnered more than 4,000 Instagram posts under the name #thecookies. Roman said both #thestew and #thecookies are beautiful to look at and easy to make, but even she can’t put her finger on what, exactly, made them go viral. “If I knew the reason, I would do it all the time,” Roman said. One explanation, at least when it comes to #thestew, might have something to do with winter weather. The dish is spicy, thanks to red pepper flakes (Roman leaves it up to the cook’s discretion for the amount included); it is creamy and fatty, due to crushed chickpeas and two cans of full-fat coconut milk; and it has a zip from the addition of tangy yogurt and ginger. The kale (or chard or spinach) and final sprig of fresh mint add a pop of green against the yellow of the turmeric-dyed broth. A spattering of crunchy chickpeas on top adds a textural contrast. “It feels like creamy and warm and comforting, almost like a bowl of macaroni and cheese, but it seems to be a lot healthier for you,” Roman said about #thestew. “It’s not about buying anything expensive or superfluous, it’s about having things in your fridge and pantry that don’t go bad that are almost always going to improve what you’re cooking,” Roman said. Stock up on spicy staples, such as harissa paste, chili flakes and a good hot sauce. And make sure you have acidic ingredients at the ready, including fresh lemon, preserved lemon and vinegars. “And things like a hunk of Parmesan cheese will go a really long way to making something more delicious,” Roman added. And while the internet is a great source to scout the latest “it” recipes, Roman said don’t ignore cookbooks. That’s how she learned to cook, and she encourages others to turn to their pages for the same education. “When you invest in a cookbook, you’re investing in a person teaching you how to cook,” she said. Roman’s second cookbook, which focuses on cooking for others, is due out in October. And who knows, it may just contain Instagram’s next big hashtag — which Roman would welcome with open arms. “That’s really my whole goal; I want people to cook, and I want to provide recipes for them to cook, and I feel like [cooking] is really empowering. It’s a really nice thing to do for yourself, so it makes me so happy to see,” she said. Find the recipe for #thestew on The New York Times’ cooking page.